Can Magath produce another miracle? Felix Magath is now just two matches away from producing a second successive Bundesliga miracle. Felix Magath will go down in history if you can lead Schalke to the Bundesliga title. Magath's Schalke side are battling it out with Champions League finalists Bayern Munich to see who will be crowned 2010 German champions. It is a position that Bayern are accustomed to. The most successful club in German football history are attempting to win their 22nd league title, as well as a fifth European Cup. Bayern are true European heavyweights. Bayern should really lift the title again this season. Victories over Bochum and Hertha Berlin, two clubs who look poised for relegation, will see them crowned champions due to their vastly superior goal difference. In contrast, Schalke have a tough match against third-placed Werder Bremen, before a final day visit to Mainz. Level on points with Bayern, Schalke need a shock to happen. 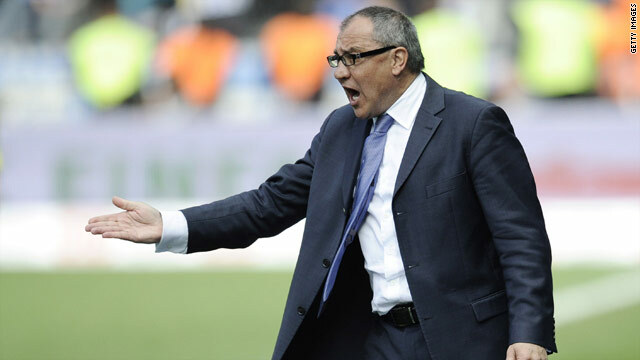 Ordinarily, I would say Schalke have no chance but their coach, Felix Magath, is no ordinary leader of men. In two seasons he transformed unheralded Wolfsburg from also-rans to champions for the first time in their history. A club previously famed for fighting relegation, Wolfsburg - under Magath - finished fifth in his first season, before stunning the elite to win the Bundesliga title last season. You only have to look at Wolfsburg's league position this season to really appreciate the stunning nature of what he achieved. This is the same Felix Magath who, in his first season as Bayern Munich coach, won the league and cup double in 2004-2005, unbelievably repeating that feat the following season, the only time in German history that a club has completed successive doubles. Now the 56-year-old, who lifted the European Cup in 1983 when captain of Hamburg, stands on the verge of marking himself down as possibly the greatest coach in German football history. Three times in the last decade Schalke finished as Bundesliga runners-up. In fact, the Gelsenkirchen side - who dominated German football to such an extent between 1933 and 1945 they lost only six league matches in 12 years - have not lifted the title for 52 years. Can Magath end that unwanted statistic and win his fourth Bundesliga title in six years with his third different club? I for one hope so. What a story that would be. What a story, what a coach, what a man. Now that Bayern goes through the CL Final, and if Inter does it as well, it will be just like 1982 world cup where in Italy and West Germany went through the finals. And where does the finals took part? At the Santiago Bernabéu Stadium of all places. Coach Felix Magath is indeed a true leader. Congratulations to the successful football coach. Though i am not a good follower of German's Bunglesliga but with your pic the man Magatha is realy great. I wish him good luck. From all indiction,magath is a really great coach.dat's wat a great coach should b known 4.i wish him good luck. "a great coach should be known for being a great coach" brilliant! I think he is one of the greatest German coaches of all time.it seems German coaches are good with dark horses,take the case of King Otto Renhagel and Greece.i give kudos to Magath! Get your facts straight, please: While Felix Magath is indeed everybody's darling these days and also scored the winner in Hamburg's epic 1-0 triumph against Juventus, he was not the Hamburg captain. Famously, Hamburg legend Horst Hrubesch lifted the trophy in Athens in '83. ps. Notable factoid: Felix Magath also scored in '77, when HSV beat Anderlecht 2-0 to lift the erstwhile European Cup Winnners' Cup. Not many people have that kind of record on their CV. Shame he can't be with us this year as HSV bid to finally win the UEFA-Cup/Europa League, aka. "the one that got away". I am a Magath fan from the wonderful HSV days and he continues to amaze me. And thanks Censeo for the reminders. It's also nice to see someone in CNN sports notice what he doing now. All the best and good luck to Schalke and Magath. I am the Ivan. It is striking me that Magath is the miricle worker. He is the amazing. I now that he is tactical man and soccer is pleasure for everyone watching. Let us hope that it is a champion again. wow. fourth league title. that is really impressive not to mention what a great acheivement that is. While the story is acurate on Magath i think its fair to also point out that he was semi successful in the past with being fired by clubs like Bayern and 1. FCN and just started to become really successful after he banded together with Bernd Hollerbach as his assistant coach. Both were not successful on their own but now as a coaching team they pull off amazing things in their clubs, which i think is also due to the fact they come of a similar background (both birthplaces are only like 50 miles apart and are in the same district). Would make an interesting story to focus on the coaching team as a whole. That will be good if he does it again. Am looking forward to play under him someday. Mourhino is a master tactician off and on the pitch. His successful ouster of Barcelona shows a man who got his act correct right from the transfer window that saw Samuel Etoo and Zlatan Ibrahimovic becoming opposing numbers. If anybody doubts that he is the best coach in the world, join me then to conspire and land him with Arsenal as his next club in the forthcoming season. I bet you, he shall repeat thesame result he has produced against Barca.Just imagine his mien; so gusty, so saucy, yet, so spicy. He serves a flavour in the football world that can tear board rooms apart at the end of a game and keep fans glued to the television set to ask for more. My God! how many bookies must have got their fingers burnt! Mourhino, has confirmed that football indeed is not mathematics. what do you think?